BUSTI, N.Y. (June 9, 2018) - Although forced to fend off challenges by one of Pennsylvania’s finest, Lemoore, California’s Carson Macedo earned his way to the top of the Arctic Cat All Star Circuit of Champions presented by Mobil 1 feature podium on Saturday night at New Stateline Speedway, leading all 30 circuits around the 1/3-mile oval to score the first All Star victory since Lee Osborne accomplished the same feat in 1970. The $5,000 payday, Macedo’s first All Star triumph of the 2018 season, increased his career win total to two with the traveling Series, also scoring a feature win during action at Lincoln (Ill.) Speedway exactly one year prior on June 9, 2017. 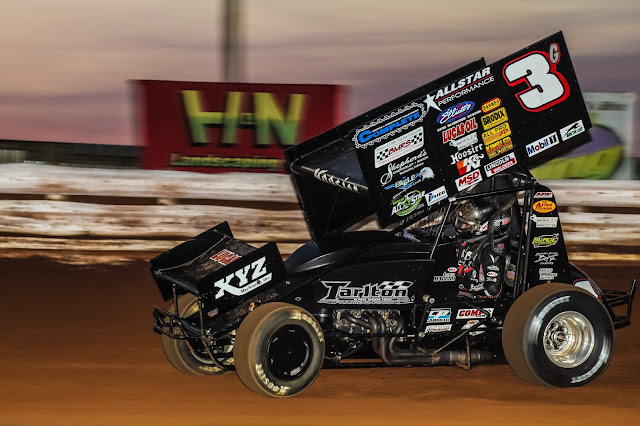 Pennsylvania Posse invader Greg Hodnett chased Macedo to the final checkers in Busti, N.Y., followed by six-time and defending Series champion Chad Kemenah, recent Outlaw Speedway winner Paul McMahan, and Tony Stewart. Utilizing his outside-pole position, Macedo was able to earn the early jump, quickly moving ahead of Greg Hodnett and Chad Kemenah as the field drove by the flagstand for the first time. Besides periods of heavy traffic and eventual pressure by Greg Hodnett, a pair of cautions, one on lap six for a spinning Aaron Reutzel, and another on lap nine for a slowing John Garvin, were the only two distractions during Macedo’s march at the front of the running order. Traffic appeared for the first time just before the midpoint of the 30-lap program giving Hodnett an opportunity to eat away at Macedo’s built advantage. As traffic intensified, so did the battle for the top spot; Macedo relying heavily on the very topside of the speedway while Hodnett worked the bottom. A miscalculated slide job effort on lap 22 was Hodnett’s first, true attempt at getting by the California native. Macedo was able to counter, immediately increasing speed and stretching his advantage back to nearly two seconds. By the time the final checkers flew, Macedo’s advantage was up and over two seconds, crossing over the start-finish line by a margin of victory equalling 2.176 seconds over Hodnett. The New York triple-header will come to a close on Sunday evening, June 10, when the All Star Circuit of Champions travel to the north side of the Finger Lakes for a first-ever visit to Weedsport Speedway. Padding an impressive All Star stat sheet in the Empire State, Weedsport Speedway will become the 14th track in the state of New York to host All Star Circuit of Champions competition. Weedsport Speedway in Weedsport, N.Y., will open pit gates at 9 a.m. on Sunday, June 10. A pit sweep will take shape at 3 p.m., followed by the All Star drivers meeting at 5 p.m. All Star hot laps are scheduled to begin at 5:45 p.m. Additional information can be found online at www.weedsportspeedway.com.